In order to meet the demands of the current and future economy in Colorado and build up a skilled workforce to achieve their goals, the state legislature passed a measure to strengthen vocational and trade school education. As a result, the state’s Departments of Higher Education, Labor and Employment have worked in collaboration to create career and technical education, or CTE, that acts as a pipeline from the classroom to the workplace by providing an education that highlights the skills employers need most. This guide helps readers find out more about vocational and trade schools in Colorado and the career opportunities they bring. The following ranking of Colorado schools provides a detailed overview of the trade and vocational options in the state. One of the biggest areas of demand in Colorado for graduates of community colleges, careers institutions and trade schools is the healthcare industry. Learn more about accredited schools in Colorado with our rankings, which take into account programs offered, financial aid availability and more. In 1925, Trinidad State Junior College became Colorado’s first community college. Its career certificate and technical programs offer training in diverse fields such as aquaculture, massage therapy cosmetology, nursing and welding. Other certificate programs are in accounting, medical assisting, agribusiness, basic law enforcement training, automotive repair and technology, early childhood education, crop science, emergency medical technology, graphic design, business management, telephone/power line technology, gunsmithing, manual machining and entrepreneurial operations. Trinidad State is a participant in the College Opportunity Fund (COF) program. In-state Colorado students may be eligible for stipends to pay for their tuition. About one third of all students attending undergraduate programs at Pueblo Community College are enrolled in Career & Technical Education (CTE). All students can apply online. Undergraduate certificates can be completed in one year’s time. The college’s wide-range of programs include certificates in automotive collision technology, barber/hairstyling, production baking, bookkeeping, business fundamentals, CISCO certificate, cosmetology, dental assisting, digital video production, early childhood teacher/director, EMT (intermediate, paramedic), firefighting/law enforcement academy completion, information assurance, massage therapy, medical coding/office, practical nursing, retail management, surveying, web design and welding. Two-thirds of recent PCC students have qualified for financial aid. Career & Technical Education (CTE) at Red Rocks Community College offers certification-granting programs focused on high-demand training for business, computer technology, health care, renewable energy and construction trades. Technical programs include certificates in information technology (computer support, game development, cybersecurity, Microsoft certified technology specialist), air conditioning, heating and refrigeration, construction technology, culinary arts, emergency management and planning, fire science, holistic health (massage therapy, yoga instructor), park ranger technology, physician assisting, plumbing, sonography, solar photovoltaic design, and water quality management. Red Rocks CC also partners with WarrenTech to offer students programs in auto collision repair, cosmetology, power equipment and sports vehicle technology, welding and precision machining. From Automotive Technology to Zoo-Keeping Technology, more than 30 distinct Certificate of Achievement programs at Pikes Peak Community College can put students to work in their chosen field within a year. The automotive collision technology program certified by the National Institute for Automotive Service Excellence (ASE) allows certificate students to choose from specialties in structural repair, painting and refinishing, plastics repair, drive trains, estimating and detailing. Computing certificates include studies in CAD drafting and quality assurance, and programming. Other certificates are offered in machining technology, nurse assisting, outdoor photography, and mammal husbandry. PPCC is also home to the Pikes Peak Regional Law Enforcement Academy. Career preparation is paramount at Arapahoe Community College where, in addition to associate degree programs, the school offers nearly 50 individual career certificates in fields like automotive technology, education, criminal justice, allied health, marketing and retail management. Career certificate programs serve as apprenticeship opportunities in many of the vocational fields with course requirements of 52 hours. Proficiency certificate programs may only require up to 15 hours. Arapahoe certificate programs are offered in automotive repair and service, architectural drafting, broadband technology, computer information systems and graphics, construction management, early childhood education, law enforcement (academy), emergency medical services, medical office, practical nursing, paralegal studies, and residential interior design. Career and technical education (CTE) in Colorado can be found in school districts around the state at the secondary school level. Students in these programs can study areas such as technology and communications, family and consumer sciences, business and marketing, and skilled trades and technical sciences, among others. Similarly, older students in Colorado can find CTE at schools in the community college and technical school system in the state. 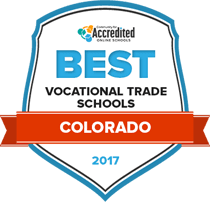 Those who are interested in finding a vocational school in Colorado can use the search tool below to explore their options. In the 2012-2013 school year, there were 32,302 career and technical education students enrolled in programs on the post-secondary level. CTE programs in Colorado are designed to represent industry sectors such as: business, marketing, and public administration; agriculture, natural resources, and energy; arts, design, and information technology; hospitality, human services, and education; and health science, criminal justice, and public safety. 97 percent of Colorado’s post-secondary CTE graduates went on to enter the workforce, join the military or start an apprenticeship after school in 2013. There are six public high schools in Colorado dedicated solely to career and technical education. Students who choose to pursue options other than a four-year bachelor’s degree in Colorado have several options for earning certificates and diplomas that will prepare them for a career. A popular choice is a two-year associate’s degree, which can be obtained through the state’s community and technical colleges. In addition, there are professional certificate programs that take one year or less to complete, which, considered together, account for a larger portion of Colorado’s vocational education than associate’s degrees. The table below illustrates the distribution of certificates, associate’s degrees, and bachelor’s degrees in Colorado compared to national averages. Some of the biggest vocational career opportunities in Colorado can be found in the healthcare field. Registered nurse, dental hygienist, and nursing assistant occupations in particular account for almost 3,000 job openings per year. This illustrates Colorado’s dedication to achieving positive health outcomes and encouraging healthy lifestyles. In fact, the state has been named one of the top ten healthiest locations in the country by America’s Health Ranking, thanks to its much-lower-than-average obesity and diabetes rates, as well as its high rates of people who engage in physical activity. As a result of the state’s high healthcare marks, there are many job opportunities for those interested in pursuing jobs in the field. There are over 16,000 healthcare employers in the state, some of which—like Craig Hospital and Children’s Hospital Colorado—are world-renown for their patient care. Other major healthcare employers include Denver Health and Hospital Authority, Kaiser Permanente Colorado, SCL Health System, and Centura Health. More information about the CTE careers with high job openings can be found in the table below, which also includes state and national salary information. One of the largest providers of CTE in Colorado Springs is Pikes Peak Community College, with over 1,300 students enrolled in vocational programs, including business, construction, healthcare and liberal arts. One popular career cluster at the school is homeland security, law enforcement, firefighting, and related protective services, with around 100 enrollees in these programs. This is not surprising, considering the strong military presence in the city. Colorado Springs is the home to several military installations—including Peterson Air Force Base, Fort Carson, and Cheyenne Mountain Air Station—which make up 20 percent of the city’s employment. Another popular school for vocational training in Colorado Springs is Intellitec College-Colorado Springs, which has over 300 students enrolled in its programs. The most popular programs at the school are in the mechanic and repair technologies/technicians category, which is the perfect pipeline to train workers for the growing manufacturing industry in the city. Colorado Springs has over 100 manufacturing companies, which produce products such as medical devices, semiconductors, and aerospace equipment. Some companies that can be found in this sector include Atmel Corporation, JPM Prototype & Manufacturing, Inc., Skyline Products, Inc., and Western Forge Corporation. With nearly 2,200 students enrolled, Emily Griffith Technical College is the largest provider of vocational and trade education in Denver. The most popular programs in the school include construction trades, healthcare, and precision production. Similarly, the Community College of Denver is another large provider of CTE in the city. Among some of the most popular programs are in the liberal arts, healthcare, and business career areas. Thanks to this education, graduates are qualified to pursue jobs in some of Denver’s most thriving employment sectors. For example, business education can prepare students for jobs in the financial sector, which has 13,800 companies and 97,000 workers in the Denver area. Also, the healthcare and wellness sector boasts 202,550 workers and consistent growth over the last decade. In 2015 alone, the Metro Denver Economic Development Corp. reported that 5.5 percent more jobs were added to Denver’s healthcare industry. The Colorado Association for Career and Technical Education is an organization that supports those who provide CTE to students around the state. Members include career counselors, teachers, and administrators. This report from the University of Colorado Boulder provides an in-depth forecast of the state’s industries. This agency is responsible for monitoring the state’s economy, including job creation and the business climate in different regions of Colorado. In addition, OEDIT provides support to small businesses and entrepreneurs. This page includes information on career and technical education on the secondary and postsecondary levels from the Colorado Community College System. This page on Colorado Department of Education provides an overview of career and technical education in the state, including specialty areas and definitions of relevant terms. Perkins Collaborative Resource Network of the U.S. Department of Education presents vocational school enrollment data based on different career clusters. This report from the Colorado Department of Higher Education outlines the impact that career and vocational education will have on the state’s economy in coming years.